Musicians who have visited their local library can probably relate to finding just a recording or printed score of a major work when both are needed. Since most libraries have to cover a multitude of subjects besides the performing arts, it is really no surprise that such gaps exist, especially with the rising costs of maintaining a collection. With compact discs now appearing in print publications, the time has seemed long overdue for a music publisher and recording company to fuse these two resources. It appears that only the German-based Ernst Eulenburg & Company owns the foresight to satisfy this aching need. Eulenburg has formed what could be a trend-setting partnership with budget recording king Naxos in the Audio + Score Series, offering a printed score and accompanying CD for several of the world's most important compositions. The Audio + Score Series is geared to those with training in musical theory, providing supplementary material on works that span 50 volumes from Bach to Wagner. Each volume contains a handy table of contents with the primary themes of each movement and track numbers; a preface that succinctly frames the works in an historical context; and a brief analysis of each composition that focuses on structure. These essays are presented in both English and German. Following are the Eulenburg urtext full scores, in a convenient study format. Besides ending the chronic problem of finding a score to accompany your recording (or vice versa), the Audio + Score Series is an ideal tool for university and conservatory students who are in the middle to later stages of their curriculum. If there is anything close to musical works being presented in textbook form, the Audio + Score Series is almost certainly it. The volumes are also suitable for music professionals looking to brush up on some of the most popular titles in the repertoire. Make no mistake that the series is geared to those with a formidable knowledge of classical biography and theory. Those with a limited classical music education will be frustrated by the prefaces, which assume that we already know about the composer's career, and the brief analyses that use compositional terms and expressions freely. These essays are succinct and informative, but could have been a tad more basic for those less in the know. It would also have been nice if Eulenburg listed the given work and movement number on each page in order to locate sections easily, although there can be no other complaints about their immaculate presentation of the music. Naxos, which has championed the budget classical CD, is in full force with a disc for each volume. 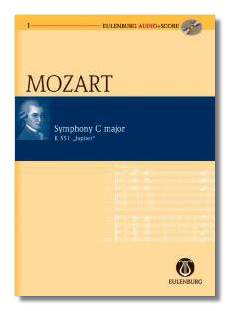 The use of Naxos recordings helps to keep costs down by using musicians of lesser prominence and simpler label design. These are not the best recordings available, but they are competent. 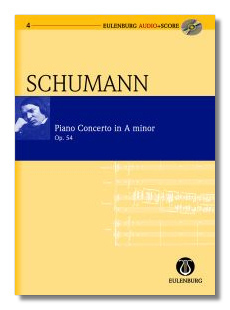 Unfortunately, the recorded music does not always match the printed score – varying touches are often thrown in – yet there is nothing radically different from the composer's writing. Eulenburg's series covers many essential titles of the repertoire, such as Bach's Brandenburg Concertos, Elgar's Cello Concerto, the Jupiter Symphony of Mozart, and the Four Seasons of Vivaldi. Hopefully, this series will find a considerable audience and grow to include works of the Twentieth Century. The current volumes are priced at ₤5.99 (about $10.90) and handsomely presented in a glossy lemon and burgundy cover with compact disc side pocket. In all, highly recommended for the developing and established musician.